Thursday, April 18, 2019 from 5:30 p.m. to 7:30 p.m.
Our second year with this fantastic event! A unique opportunity for the real estate alumni groups from three amazing schools to get together and network. 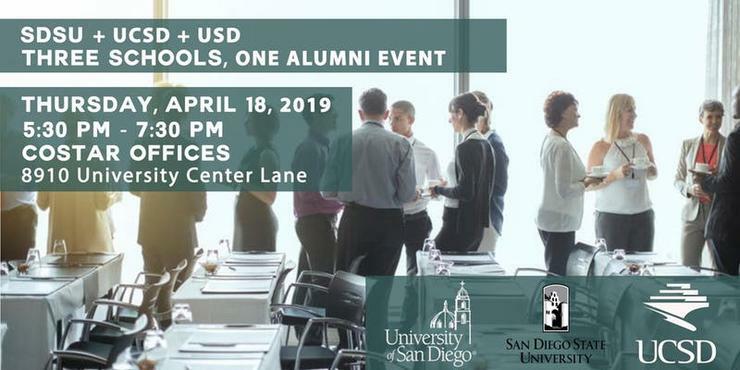 We are excited to bring together SDSU, UCSD and USD and their real estate alumni organizations to meet each other and network as we work to build an even stronger real estate community in San Diego. Light appetizers and drinks will be served.